Covering an outdoor kitchen, code issues? Depending on which jurisdiction you live in, covering an outdoor kitchen can be a code violation. In some counties, if the roof is not screened in and you put the cooking station on the perimeter of the roof, they allow that to pass. A common cover is a pergola like the one featured above left. This is allowed in all jurisdictions because the covering is not solid allowing the fumes to dissipate. Pergolas are very appealing aesthetically and do provide some protection from the sun if there are enough timbers installed above. They do not however keep the rain from hitting you. How can I put my Green Egg into my stone outdoor kitchen? We get asked all of the time about the integration of the Green Egg into an outdoor kitchen. We also get asked simply what kind of stand can I use instead of the retail stand that you can purchase with the Green Egg? Archadeck of Charlotte has masons that custom build “nests” around the egg that serve as quite functional and beautiful. If you love outdoor cooking and living, the Green Egg has become an important addition to the space. While it was introduced as a high quality smoker of meats, fish, and vegetables, it is commonly used to grill as well! 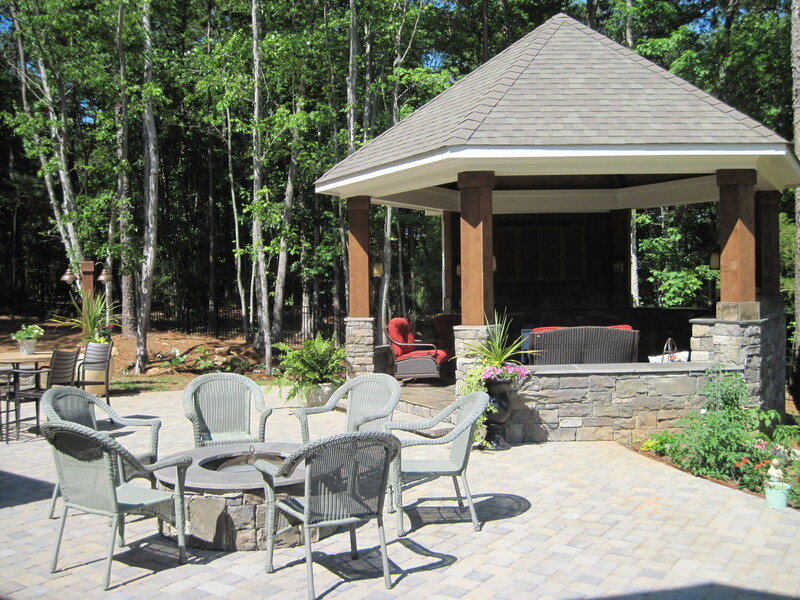 We have a great variety of designs for outdoor kitchens in our photo gallery at https://archadeckofcharlotte.com as well as on our Pinterest page. Designing a custom pool house or pool cabana? What should be included? 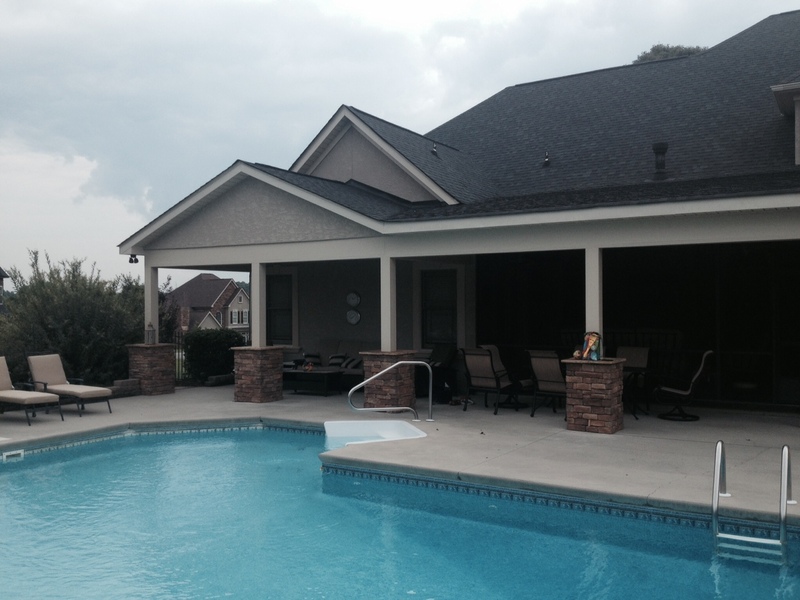 At Archadeck of Charlotte, we get called upon more frequently than ever to design and build pool houses and cabanas. With people moving their lives outdoors, the want is to have all of the conveniences closer to where they are spending their free time to entertain friends and family. The outdoor pool business appears to be booming based on the number of requests we are getting for these structures! We begin with space planning. How many people will typically use the space? What functional purposes are we trying to solve for? Along with shade protection and weather protection, what other conveniences do you desire? Outdoor shower? Outdoor bar? An outdoor fireplace either free standing or integrated into the cabana? These are logical starting points when beginning the design process for a pool house. Thinking about changing facilities and a restroom? All of these items require space planning and architectural thought! What type of roofing will you desire? Standing seam metal roofing? Architectural fiberglass shingles to match your home? What about flooring, a non-slip tile or some other masonry surface? This structure can serve a dual purpose of hiding and housing your pool equipment as well. We have a beautiful photo gallery for you to gather design ideas at charlotte.archadeck.com as well as houzz.com as we feature our projects there as well!